2College of Biotechnology, Tianjin University of Science and Technology, Tianjin, China. Received 10 July 2009; revised 21 August 2009; accepted 31 August 2009.
into SMCs, myocardin and MRTF-A were activated. conditions, such as in the presence of some cytokine. smooth muscle (SM)-actin expression in MSCs . 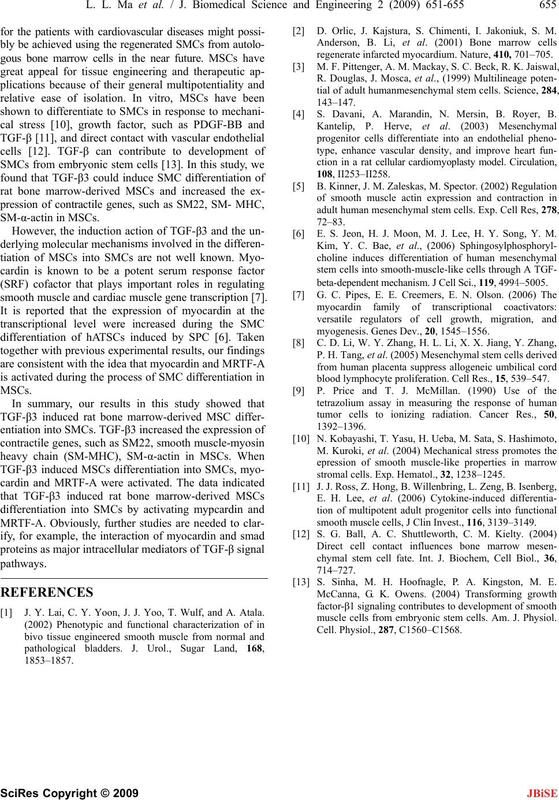 in bone marrow-derived MSC differentiation into SMCs. University of Science and Technology (20080409). mRNA level after MSCs were induced by TGF-β3. 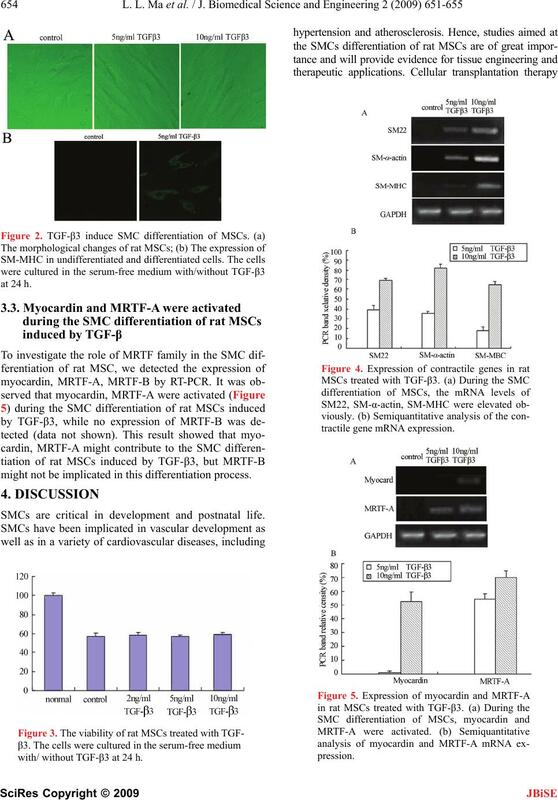 β3-induced SMC differentiation in MSCs. goat anti-mouse IgG were purchased from Santa Cruz. 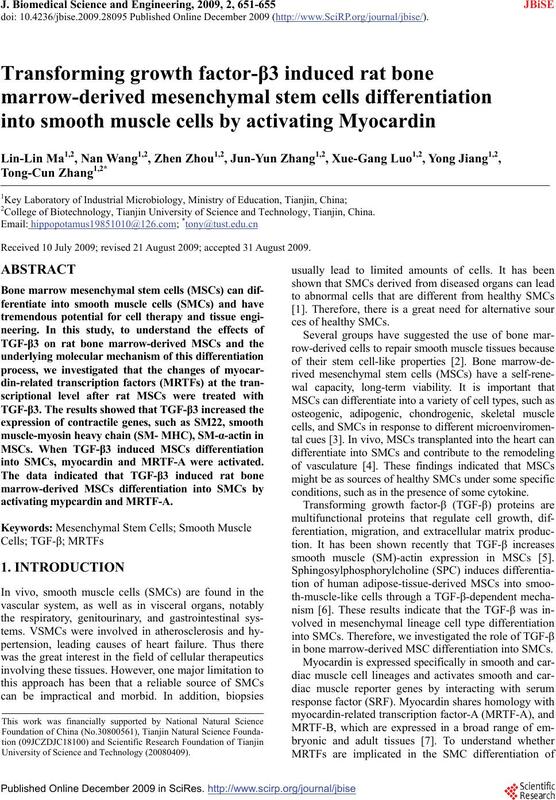 nonadherent cells were removed by replacing medium. 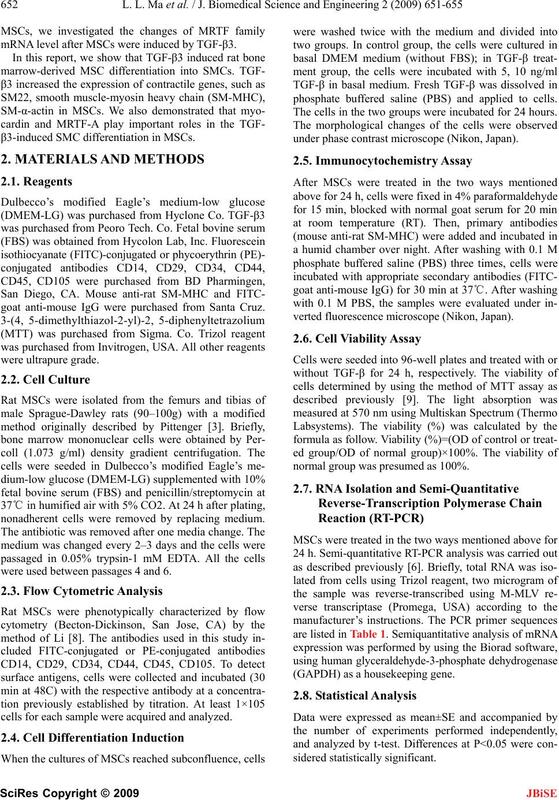 were used between passages 4 and 6.
cells for each sample were acquired and analyzed. phosphate buffered saline (PBS) and applied to cells. The cells in the two groups were incubated for 24 hours. under phase contrast microscope (Nikon, Japan). verted fluorescence microscope (Nikon, Japan). normal group was presumed as 100%. (GAPDH) as a housekeeping gene. CD14, CD34, the leukocyte common antigen CD45. with TGF-β3 significantly changed the cell morphology. phology, and intracellular fibrous structures were visible. TGF-β3 exhibited the positive SM-MHC (Figure 2B). Table 1. The PCR primer sequence. Figure 1. 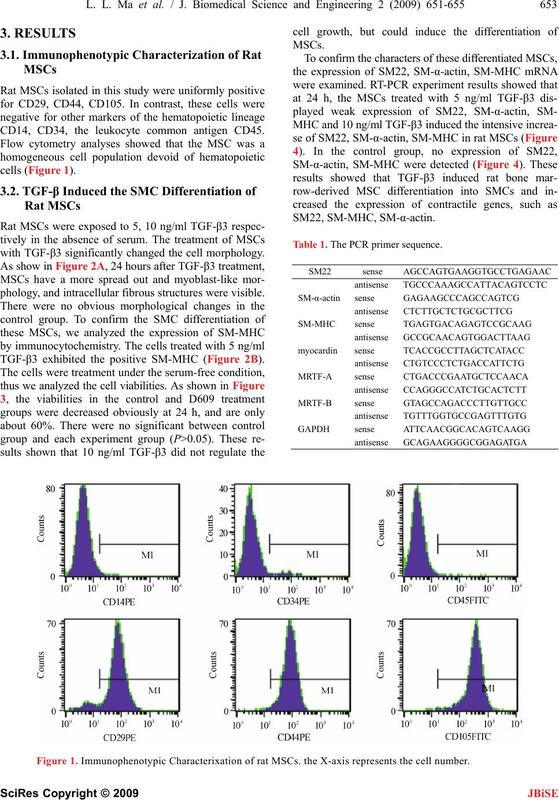 Immunophenotypic Characterixation of rat MSCs. the X-axis represents the cell number. might not be implicated in this differentiation process. with/ without TGF-β3 at 24 h.
oon, J. J. Yoo, T. Wulf, and A. Atala. smooth muscle and cardiac muscle gene transcription . D. Orlic, J. Kajstura, S. Chimenti, I. Jakoniuk, S. M.
regenerate infarcted myocardium. Nature, 410, 701–705. S. Davani, A. Marandin, N. Mersin, B. Royer, B.
 E. S. Jeon, H. J. Moon, M. J. Lee, H. Y. Song, Y. M.
beta-dependent mechanism. J Cell Sci., 119, 4994–5005. myogenesis. Genes Dev., 20, 1545–1556. blood lymphocyte proliferation. Cell Res., 15, 539–547. stromal cells. Exp. Hematol., 32, 1238–1245. smooth muscle cells, J Clin Invest., 116, 3139–3149. S. Sinha, M. H. Hoofnagle, P. A. Kingston, M. E.
muscle cells from embryonic stem cells. Am. J. Physiol.